Today, we bring you another project which shall either be embarrassing, stupendous, or both, and possibly prove once and for all that you should think twice before admitting you know me. This inspired – or at least prompted – the thought that I could probably fit it all on an old backpack frame, if I were crazy enough to try, and could find a backpack frame. After weeks of prowling curbs and checking out Goodwill I remembered Dad had one in the basement. (Thanks, Dad.) 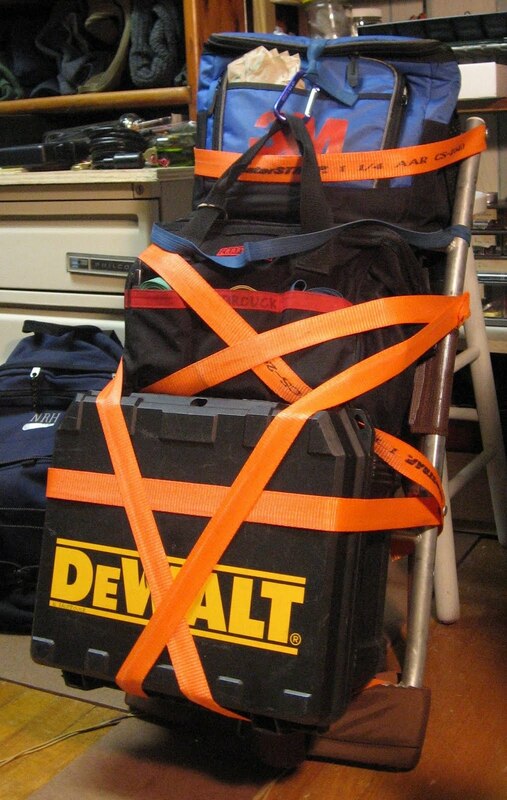 With the addition of some snazzy 1-1/4″ safety-orange webbing I snagged from the dumpster at the freight warehouse, we got us a lean, mean, tool-carrying… thing. Now at least I can break my back eccentrically. …in a geeky sort of way. Find me. We return for a special broadcast on the weirdness of CNN. On the front page today is a poll with the blaring healine: Most doubt Bush has plan for Iraq victory. Initial reaction: then what in tarnation is this? After reading the actual poll article, we find some interesting things. (CNN) — As President Bush launched a new effort Wednesday to gain public support for the Iraq war, a new poll found most Americans do not believe he has a plan that will achieve victory. But the CNN/USA Today/Gallup poll released Wednesday night also found nearly six in 10 Americans said U.S. troops should not be withdrawn from Iraq until certain goals are achieved. Just 35 percent wanted to set a specific timetable for their exit, as some critics of the war have suggested. The poll conducted Wednesday does not directly reflect how Americans are reacting to Bush’s speech, because only 10 percent of the 606 adult Americans polled had seen it live and two-thirds had not even heard or read news coverage about it. Among poll respondents, 55 percent said they did not believe Bush has a plan that will achieve victory for the United States in Iraq; 41 percent thought he did. Bold text mine. Now, we would like to point out that the percentage of people polled who think that Bush has a plan for vicory (41%) is higher than the percentage (33%, derived from the 2/3rds figure above) who have heard coverage of President Bush’s speech Wednesday. How can this be? Assuming that those who have not heard any news coverage (66%, the 2/3rds figure above) also have not heard of of the plan (released Wednesday), I personally would count those poll numbers to be out of date.